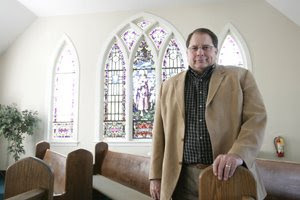 Today’s edition of the Bowling Green (Ohio) Sentinel-Tribune has a story about Curtis Miller, pastor of the Grace Brethren Church there. To read the entire story, click here. There are a number of John Deere toy tractors in Pastor Curtis Miller’s office at Bowling Green Grace Brethren Church – and they’re not there just to be played with by children. Up until 2003, Miller was a successful farmer in Kansas, tilling 6,500 acres (most of them share cropped), raising 500 feed cattle a year and publishing a book on grain marketing and a weekly newsletter with marketing advice. Even his salvation experience took place next to a tractor in 1973. Though the 56-year-old delights in his second career as a pastor, the tractors on display keep him in touch with his farming roots.Some small farm-related items even provide him with ideas for his children’s story sermon. A small branding iron he used on cattle provided him with the concept of the Holy Spirit sealing Christians. An empty, but sealed, can of corn reminded him of people who say they are Christians but they’re empty. He even applies corn genetics to 2 Peter 1:4 which talks about a Christian’s spiritual genetics and the divine nature of the Holy Spirit living in them.